Perhaps due to my affection for Oscar Peterson, I have long been a fan of pianist and Peterson protégé Benny Green. 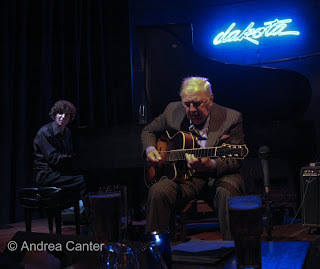 Until this winter, Benny’s last local appearance had been at the old Dakota with guitarist Russell Malone. He had been at the club a few times prior, usually as the keyboard anchor for the Ray Brown Trio. I saw Benny with the Dizzy Gillespie Alumni All-Stars at the Blue Note in Manhattan a few years ago, and he was eager to return to the Twin Cities and the new Dakota. It took a few more years to get Benny to town, but in recent months he was on stage with vocalist Belinda Underwood and again with Christian McBride and Greg Hutchinson in tribute to late mentor Ray Brown. The latter ensemble provided one of the most satisfying mainstream gigs I’ve heard locally. Early this week, Benny returned for a “blind date” of sorts, arranged by Dakota owner Lowell Pickett. 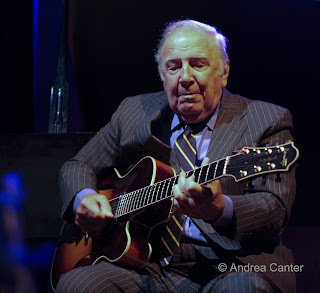 To paraphrase Benny, Lowell called and asked him if he was interested in a duo gig with the king of swinging jazz guitar, Bucky Pizzarelli. “How much do I have to pay?” asked Benny. Presumedly, Benny got a free ticket. Surely, the rest of us paid far less than the face value of the music. Having never met prior to their sound check Monday afternoon, Benny and Bucky proceeded to plant a most delightful, alternately swinging and exquisite garden of instrumental music. The joy of the harvest was ours. On the surface, the two musicians offer significant contrasts—at a very youthful 45, Benny Green’s muppet locks and impish expressions would seem generations removed from the white-haired, pinstripe suited, 82-year-old master of the seven-string archtop. Benny swings hard from a firm core of tradition, but his repertoire is rooted in bop and post bop playlists, his employers ranging from Art Blakey to Freddy Hubbard to Betty Carter. Bucky grew up in the Swing era and has mastered the songbooks of the great composers of the 30s and 40s, his resume rich in swing credits from Benny Goodman to Stéphane Grappelli. Yet join these two souls together on stage and the result is pure ecstasy with a swing beat in perfect alignment. With little time to merge their songbooks, the pair came up with two distinct sets repeated across the two evenings, and in true jazz fashion, they never played the same way once, yet always danced together. Their respect for one another was a given from the opening note, and only grew over the two nights. Noted Benny, “Bucky is every self-respecting jazz guitarist’s father.” Bucky, in return, spent much of the evenings beaming at his young cohort, nodding his head, grinning ear to ear, gesturing approval like a proud dad who just discovered a long-lost offspring. If they don’t share genetic material, they surely share the imprint of the same tradition. Many of the selections were pure swing magic, one or the other musician casting off a melodic introduction before the conversation emerged, the rhythm buoyant with love and energy—“Robbin’s Nest,” “Tangerine,” “Stompin’ at the Savoy,” “Jitterbug Waltz,” “On Green Dolphin Street.” A few tunes dropped the emphasis on swing in favor of delicate balladry-- “These Foolish Things,” “Easy to Remember,” and a virtuosic display from the pair on two renditions of “Body and Soul” that differed significantly across the evenings. The second version was reconstructed so fully that it was nearly unrecognizable til the final choruses—a surprising break in the swingfest that proved the wide range of both artists. 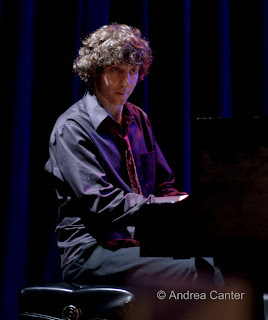 Each set also featured a unique medley, one featuring the tunes of Harold Arlen (“Come Rain or Come Shine,” “Last Night When We Were Young,” and “Sleepin’ Bee”) and the other highlighting the range of Duke Ellington’s work (“Do Nothing Til You Hear From Me,” “In a Sentimental Mood,” “In a Mellow Tone” and “Satin Doll” wrapped around Billy Strayhorn’s luscious “Passion Flower”). Even these mostly well-worn compositions offered interpretative surprises, Benny comping with an almost Eastern Zen on “In a Sentimental Mood;” the pair stretching out on their variations of “In a Mellow Tone.” And the blues were not forgotten, as the duo romped through “Limehouse Blues,” Bucky channeling a bass accompaniment. Two traits shared by both musicians were displayed in neon throughout the evening—their ferocious swing chops and their impeccable articulation at any speed. Every note had its own identity, its own space—times two. One of the attractions of live jazz is witnessing moments of musical creation. Those in the Dakota audience August fourth and fifth witnessed not only the spontaneous combustion of sound and rhythm, but the happy collision of soulmates finding each other for the first time. It was a dance of first love. Photos: (Top) Benny and Bucky under the Dakota's new neon glow; (Middle) Benny Green; (Bottom) Bucky Pizzarelli, all from opening night, August 4th. Photos by Andrea Canter.